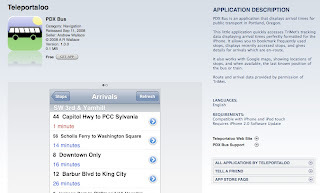 PDX Bus is an application that displays arrival times for public transport in Portland, Oregon. This little application quickly accesses TriMet's tracking data displaying arrival times perfectly formatted for the iPhone. It allows you to bookmark frequently used stops, displays recently accessed stops, and gives details for arrivals which are en-route. It also works with Google maps, showing locations of stops, and when available, the last known position of the bus or train.